Easiest dinner ever. Boil ravioli from a package (I like Monterey Pasta Co. or Trader Joe’s, in this case), heat butter and drizzle it over the drained ravioli. Add freshly shaved parmesan and tomatoes or other veggies as a garnish. I used Trader Joe’s Lobster Ravioli tonight – delicious – and served it with a salad. Done. On the way home tonight, I had a sudden craving for Panda Express’ chicken and mushrooms, which I used to order when I graced the food court. 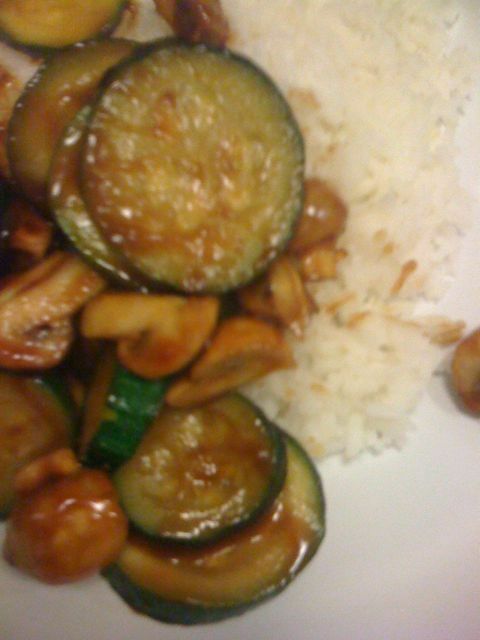 With rice in the cupboard, I dreamt up my own vegetarian version using zucchini and mushrooms from the corner market. I picked up some Hoisin sauce, which seemed like the right fit without being certain. It worked! But chicken was definitely missed this time around. Just dice the mushrooms into quarters, slice the zucchini, and stir fry with 2 tablespoons Hoisin sauce until the veggies are tender (10-12 minutes). Serve over rice – which I make in the rice cooker simultaneously. The best part of the meal was the price – it cost less to purchase the veggies and sauce than my average lunch purchase! Our foodie friends visited this weekend, so we ate (and drank) quite well. I experienced my favorite meal in San Francisco, so far, at Zuni Cafe. In addition to the famous “One Hour” Chicken, we shared appetizers and entrees among the six of us, including fresh oysters (better than the Ferry building, even! ), marinated olives, a refreshingly zesty Caesar salad, fettucini, leg of lamb, and gorgonzola with honey for dessert. It’s hard to beat a fabulous weekend of SF’s best eats, so Monday comfort food is in order. I’m re-heating ground turkey from last night (burritos) and making buttery mashed potatoes for an ad-lib shepherd’s pie. While delicious and hearty, this concoction is not the most photogenic of dishes, so I’ll leave the results to the imagination. First night: To maintain the steady influx of vegetables in our diet, I made capellini with “spring” veggies. Start by sauteeing mushrooms with olive oil in a saucepan, add peas and a broccoli/cauliflower/carrot mix (straight from the microwave). A little extra olive oil in the end makes it all blend nicely with the delicate pasta, plus a little shaved parmesan adds flavor. Part deux: Tonight, David heated chicken apple sausage in a pan, which he added to the leftover pasta for a little protein boost. Man + meat + fire = dinner.